This is one of my favorite dishes to make and Jenn says that if I were ever on a cooking show and they asked what my 'signature dish' was, this would be it. I tend to agree with her and this was probably the best it's ever come out. 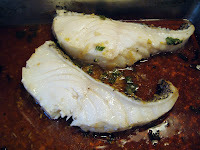 I usually use some kind of Sea Bass or Red Snapper and this time around the only Bass they had at our local A&P happened to be Chilean Sea Bass. It's definitely not cheap but if you're willing to spend the money I'd say it's the way to go! 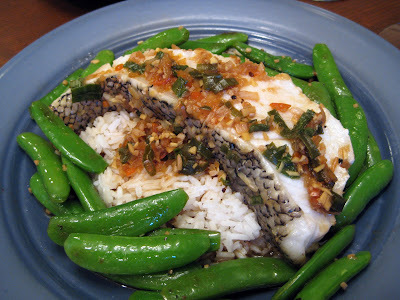 This dish is based off of a family recipe from my Chinese side with a few minor tweaks. Mainly the spiciness and the lime juice. I start by chopping up all my ingredients for the sauce. I don't have a food processor and chop things pretty quickly but a food processor might not be a bad way to go about this if you have one. Basically you need enough sauce to go with your fish when you serve it and it should taste and smell pretty good by itself so I go by taste when making it. We used a pretty sweet Riesling and I added a little more sugar than usual and both seemed to work out very well. I also usually put in some hot red pepper flakes and decided to buy some actual hot peppers instead. They weren't labeled at the store and I bought three, thinking, how hot could they be? I started mincing the first one and ate a small slice and was dumbfounded by how hot it was so I scraped out the seeds (which tend to add a lot of heat) and only used half of it and in the end it really wasn't too hot. You want to bake this in the oven for roughly 20-25 minutes at about 425 degrees. You also want to make sure it's tightly covered. You can create a foil pouch or just cover a baking pan with foil. Mine was the same size I would make brownies in (I don't bake much). I tend to be able to tell when it's done by the smell when I open the oven door but you may have to check on it. You can tell I took a nibble to check it in my photo... It was good. In the end I served it over some Jasmine rice (1/2 cup uncooked) with some snap peas that I just sauteed in some olive oil, garlic and cracked black pepper. I cooked them covered for probably 5 minutes on medium heat until they were just soft enough to eat without being mushy. The fish ended up being very good and kind of buttery which I found funny since there was no actual butter in the recipe. Also check out Sasha's Asian-infused sea bass with a papaya marinade! Oh wow this is wonderful! 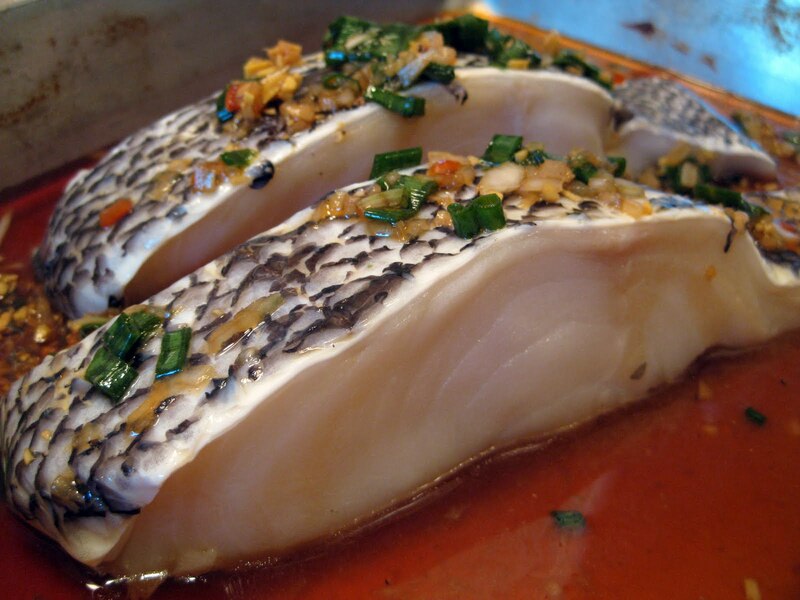 I love sea bass! Awesome! I'd love to hear about the results if you try it! 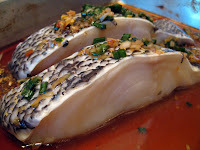 I love the buttery texture of sea bass and the seasonings on this sound as though they would compliment the fish beautifully.